As most people are aware, the IMO voted in its 70th session of the Marine Environment Protection Committee (October 2016) to globally cap the maximum amount of sulfur allowed to 0.5%. HFO will be further allowed (there is no mandate to disallow usage) provided it meets the set standards. Alternative measurements like scrubbers are also accepted to reduce the ships emission. The number of 0.5% had already been unanimously adopted in 2008 during a meeting of the MARPOL Annex VI review group, and was ratified by 53 countries (81.88% of tonnage). The date of implementation depended on the outcome of a study which the IMO conducted and presented this August (study carried out by CE Delft). The study aimed to determine if sufficient production and therefore availability of low sulfur fuel oil (LSFO) would be likely. A positive outcome would set the date at 2020, whereas a negative prospect would allow another five years before the new regulation became effective. Bloomberg estimated that the global cap would add 250 million metric tons of LSFO to global demand. The IMO study concluded that there are no bottlenecks of low sulfur fuel to expect, whereas another published study by EnSys (Energy & Systems Inc.) claimed the opposite. It is worth noting that EnSys made an unsuccessful bid to carry out the official IMO study. The EnSys study was supported by BIMCO and IPIESA, an oil and gas industry association. This may have its roots in the fact that the European Union has already agreed that the sulfur cap will be effective for all 200-mile deep EU Member coastlines by 2020. The coastline reaches partly into the Indian and Pacific Ocean as some states have territories overseas. Setting the date to 2025 would make the North African Coast corridors where 3.5% sulfur is still allowed, too close to many European States for the liking of the EU regulators. Does the Sulfur Cap Make Sense? It might in fact be a case of too little too late. Not only does the European Union take over action regarding environmental regulations and leaves the IMO behind in the political field, in addition the IMO regulations are too weak and the cap agreed on is too forgiving, from an environmental point of view. The IMO wasted 10 years following Kyoto which tasked the organization with regulating greenhouse gas emissions. This was stated by Bill Hemmings, Director of Aviation and Shipping of the NGO European Federation for Transport and Environment, which is counseling the UNO on environmental issues. Shipping companies and ship managers may cringe because of the ever-rising costs of remaining compliant by using better fuels like marine diesel or expensive technologies like scrubber. Conversely, NGOs and scientists cringe because even 0.5% of sulfur is still five hundred times higher than sulfur limits in diesel for cars, where its capped at 0.001%. 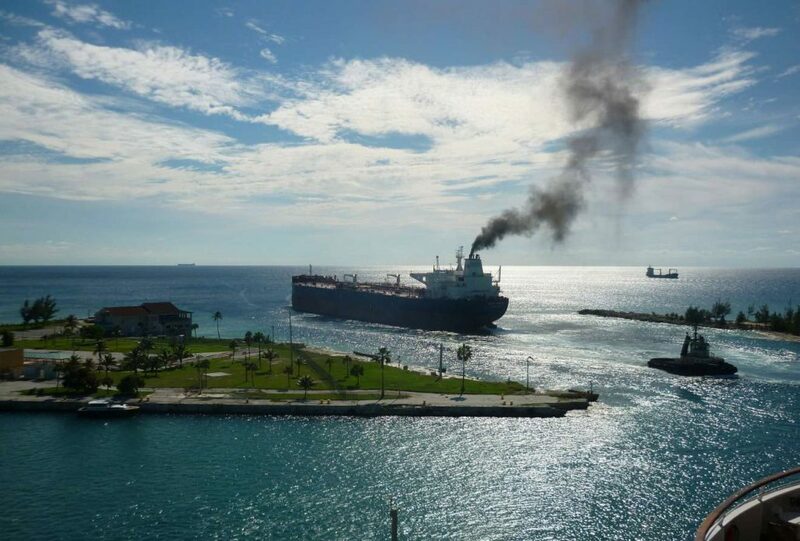 It has long been known that vessels pollute the environment much more than all cars combined, and that they cause tens of thousands of premature deaths alone in Europe. So, does it makes sense to further reduce sulfur? Yes it does, but many companies will be affected negatively. However, there are other points to consider when judging the environmental impact. The high sulfur exhaust of vessels helps to counter the CO2 greenhouse effect. This is because the sulfur dioxide reduces the amount of solar energy reaching the surface, hence it cools down the planet. This man-made influence is dwarfed by natural sulfur oxide exhaust of algae, which produce a compound called DMSP (dimethylsulfoniopropionate). This compound is released slowly over time from algae close to the surface and act as a sun screen. When other phytoplankton start eating the algae DMSP is released in big quantities into the water from the digested algae. Bacteria in the water start processing the chemical, creating dimethylsulfide (DMS), a gas which leads to the formation of clouds (cloud condensation nuclei). Close to the coastline we recognize this as the so typical “ocean smell”. Clouds are most important for maintaining the climate as they reflect solar energy back into space, just as SOx (sulfur oxide) does. This process is threatened by an effect called ocean acidification. The ocean basically acts as a CO2 sink by binding CO2 from the atmosphere. This makes the ocean more and more sour, because the carbon dioxide reacts with water and forms H2CO3 (carbonic acid). Ocean acidification is a major cause of dying coral reefs and the destruction of phytoplankton, which we need to produce DMS for cloud building. Since the beginning of the industrial revolution the so-called ocean acidification has stored roughly a third of all man-made emissions. It might look far-fetched, but refining an additional 250 million metric tonnes of fuel has a very negative impact on CO2 emissions. Firstly, the additional production steps demand additional energy and it is likely that this will be covered by burning non-renewable resources, secondly the refining itself sets free CO2 emissions. Therefore, capping sulfur will accelerate global warming to some degree. Vessel owners basically can decide between different strategies to meet the requirements, all have advantages and disadvantages. They can buy more expensive low sulfur fuel oils like MGO/MDO or new ECA fuels, e.g. Exxon’s HDM50. In total, there are more than 20 new blends. Despite investment and operational costs there are additional less obvious expenses. One is the loss of cargo room when fitting a scrubber into the vessel. The German ferry company TT Lines carried out a pilot project, fitting four scrubbers as hybrid systems (open and closed loop) into its ferry ROBIN HOOD (6300 tdw, 180 m length). Last year, at the ISF Conference at the University of Flensburg in Germany, the company presented the results of the project. The ROBIN HOOD scrubbers were fitted into its port and starboard funnels, whereas the two container sized engine compartments had to be fitted below deck, blocking approximately one sixth of its deck cargo space. In total 17,500 meters of electric cable, 700 meters of GRE pipes and 2,000 pieces of components had to be installed. New equipment comes with new administrational effort and additional maintenance jobs. Few ranks are familiar with the new systems, leading to higher costs in the beginning. Due to the new maintenance jobs time is taken out of the tight schedule. Vessels which are switching permanently from HFO to low sulfur fuels instead of using scrubbers, may run into similar problems as today when entering SECAs. Dr. Reinhard Krapp of the VDR (an industry association of German shipping companies) published in 2014 a paper named “Industry Guidance on Compliance with the Sulphur ECA Requirements” and pointed out a number of problems when switching fuels. One of the main aspects are operational problems using engines optimized for HFO on MGO/MDO when running for longer durations. It is assumed that this is due to a lower injection temperature (approx. 100° C lower), which causes stress on the surrounding materials and seals. Another factor might be that MGO/MDO have higher homogeneity leading to a faster rise in pressure when combusted. This might change the vibrations and force transmission says Dr. Krapp. As a result, fuel could leak into lubricants. He also pointed out that the energy density of current HFO is approximately 8% higher than that of distillates. In return, distillates have a 2% higher net calorific value, with a net loss of approximately 6%. Lower acidity: Part of the sulfur is converted into sulfuric acid (H2SO4) during the combustion process. Using common cylinder oil with a high alkali base number will lead to wear, as the amount of sulfuric acid is now lower. The much lower viscosity and reduced lubrication can cause abnormal wear. Enforcing the sulfur cap in international waters might be challenging. The questions are, who is monitoring it and who pays for it? If the regulation is to be taken seriously then enforcement and control must occur, otherwise thee will be no incentive to carry out the regulation. The most likely solution will be the introduction of some technological recording and measurement of emissions. At least the surveillance close to the outside borders of SECA zones will be less troublesome, because technological measurements inside the zones already exist for the purpose of supervising them. Authorities corporate within the areas, e.g. the joint surveillance Bonn Agreement (North Sea) to detect oil spillages and harmful chemicals, and similar agreements between HELCOM members (Baltic Sea) are in place. A number of tools like airborne surveillance are used to determine vessel emission (NOx, CO2, SO2) and could be applied further outside of current zones. These airplanes use antennas to “sniff” emissions from nearby vessels giving hints to Port State Control officers about which vessel to enter. The advantage over optical systems like differential optical absorption spectroscopy (DOAS) is that the system can be deployed at night or on cloudy days. The PSCs of Paris MoU and Tokyo MoU have already been announced this November to increase their focus on sulfur limit regulation and to plan a major campaign for 2018. The concentrate campaign indicates that embarked officers will thoroughly examine the vessel to determine whether it has remained compliant. However, realistic long-term surveillance options for international waters have not been revealed yet. So far PSC has no power outside its own waters and could only inform the flag state about sulfur limit exceedance. The idea to obtain emission data by multiplying fuel emission factors by vessel journey data is interesting. This is much more an organizational than technological challenge. Bunker agents would need to deliver precise data about the ship they have sold and the type of bunker, requiring in turn an additional monitoring system. Vessel journey could be calculated by combining available positioning data, e.g. from HELCOMs Automatic Identification Systems (AIS), with other available data sources like Lloyd’s Fairplay database of vessel machinery, and operational data from the ship. Monitoring and storing the data of wash water discharge and emission exhaust from scrubbers within the voyage data recorder, would allow a meaningful combination with GPS data, thus, creating a system which could be used to determine when, where and how much SO2 a vessel emits. The only possible way to make absolutely certain that vessels are not switching back to HFO would be to disallow bunkering of HFO if a vessel does not possess a cleaning system. However, until a functioning control system is up and running many will try to exploit loopholes. As often reported the MARPOL Annex VI states that the vessel “shall not be required to deviate from its intended voyage or to delay unduly the voyage in order to achieve compliance” (Regulation 18, 2.2). Thus, the concerns are that vessels will bunker on purpose in these harbors where only HFO is available. Less widely reported is the fact that this phrase applies only if the ship can present a record of actions taken to achieve compliance and evidence provided “…that it attempted to purchase compliant fuel oil in accordance with its voyage plan and, if it was not made available where planned, that attempts were made to locate alternative sources” (Regulation 18, 2.1.1 and 2.1.2). Furthermore, the vessel needs to notify the competent authority that a compliant bunker was not available (pro-active). These measurements minimize possible abuse of the exemption. Despite monitoring the cap, the distribution of suitable fuels is the main challenge. It appears that many ports will not be able to deliver LSFO in satisfactory amounts by 2020. The International Bunker Industry Association (IBIA) warned that many ports and countries will not be able to replace the current supply level of HFO with LSFO in time. These ports would then need to import bunker fuel from distant refineries. In return this would lead to a higher non-competitive bunker price and additional environmental pollution, due to transport, creating winners and losers on the bunker market, where the winners are those who are able to satisfy demand for a good price. Especially jeopardized are those ports which relay exclusively on local refineries. If there were to be regional imbalances the bunker market might shift towards the regions that can provide compliant fuels. But why are the refiners unable to satisfy demand despite the fact that four years remain, and considering that the sulfur limit level has been known since 2008? We do not know why they are moving so late. IBIA for example pointed out that before the due date few vessels will be using the more expensive refined fuels. Most vessels will only switch when necessary. This is dangerous as it could lead to a situation where the “world fleet” tries to switch overnight; such a spike in demand could not be handled. Similarly, refiners will try to add capacity as late as possible. Today refiners are especially concerned about who will buy high sulfur fuel after 2020 and how to expand the production of LSFO. Demands could be met by blending bunkers with distillates to create HFO with S ≤ 0.5% or by processing away sulfur (hydroconversion / hydrodesulfurization). The last option requires additional production steps and (if not in place) additional equipment. To blend bunker, low sulfur distillates are mixed with high sulfur residuals to create the required sulfur content. The used distillates are lost for the market. Both options will have residual “left-overs” from production. In addition, the maritime industry will start to compete with other shore-based industries by acquiring higher distilled fuels. Refiners will then sell to the market offering the greatest returns. How big is the shift? The IMO study sets the high sulfur fuel oils demand of 2012 as its base for its calculation, it was 228 million metric tonnes. In 2020 this could sink to 36 million tonnes (p. 13). Refiners would sell ~85% less high sulfur fuels to the maritime industry than they did in 2012. The IMO concludes that these oils will be a niche product, only used by ship operators who decide to install scrubbers. By 2020 more than 3,800 ships are expected to use such cleaning technology (p. 151). How big is the market impact? Since the end of the 80s the global demand for residuals (all industries) has been sinking continuously, despite maritime demands for HFO rising continuously. In 1990 almost 13.3 million barrels per day (BPD) of residuals were produced. In 2012 production and demand were both four million BPD lower. On average, the maritime industry requires roughly 35% of the global residual fuel production for HFO, the other 65% is consumed by shore-based industries such as power plants. Dealing with an HFO surplus and avoiding market disruptions for non-maritime HFO demands is the real challenge, not producing enough S ≤ 0.5 fuels. This matters because it shows that maritime bunker is only a share of the refiner’s residual fuel oil customer portfolio.